Neil J. Kelleher of Troy, an alumnus and former employee of Hudson Valley Community College, was appointed by the Rensselaer County Legislature to a second term on the college's Board of Trustees. 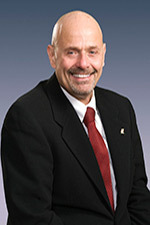 Kelleher first joined the board in March of 2011. His reappointment marks the beginning of a second consecutive seven-year term concluding on June 30, 2024. He currently serves as the chair of the board, a post he was elected to in 2015 following two years of service as vice chair. He also chairs the college's presidential search committee. "Neil is an exceptional leader for the college's Board of Trustees, and I've been fortunate to work with him for so many years," said President Drew Matonak. "Neil has extensive knowledge of our institution, decades of governance experience and a true passion for our mission. We're extremely grateful that he has decided to accept a second term, and also for his ongoing dedication to the greater college community." "It's an honor to continue to serve on the college's Board of Trustees, and I'm thankful to the Rensselaer County Legislature for the opportunity," said Neil Kelleher. "As a graduate of the college and lifelong resident of our region, I have a first-hand understanding of the many benefits Hudson Valley provides to its students and the greater community as well. I know I am but one success story among thousands, and I'm glad to be able to give back to this incredible institution." Kelleher retired from Hudson Valley in 2010 after 23 years as a physical plant supervisor and special assistant to the president for capital projects. He was a member of the Rensselaer County Legislature from 1990 to 2010, serving the last 14 years as its chair. In his role as a legislator, he worked with the college on capital projects, budgets and master plans. A 1991 graduate of Hudson Valley Community College, Kelleher received the Distinguished Alumni Award in 2000 for his many civic and charitable accomplishments. The ten-member board of trustees is the governing body of the college, overseeing administrative and academic matters. Kelleher's appointment to the board in 2011 was made by the county legislature, which appoints five members of the board; four other members are appointed by the governor of New York; and a current student, elected annually by the student body.